CLICK HERE to read our full coverage of San Diego Comic-Con 2015. After attending the Image Comics panel, I wanted to check out a session about one of my other favourite publishers, so I found myself at BOOM! Studios Celebrates 10 Years and Pushes Comics Forward. The panel’s moderator, Filip Sablik, BOOM!’s president of publishing and marketing, introduced the hour as not just an opportunity to talk about the projects on which the gathered panelists were working, but a chance to have a public conversation about the comics industry, what’s happening in it, where it’s going, and what they would like to see from it in the future. After identifying everyone on the panel and listing their individual credits, he made a formal statement to set a tone for the discussion. It started with an acknowledgement of the obvious influence that comics have had on mainstream entertainment and went on to recognize the changing face of fandom, as visible at conventions like San Diego’s. He noted that web-based and independent comics had been recognizing a broader audience for a longer period of time, but that recent attempts at greater inclusivity and accessibility made by BOOM! (as well as Marvel, DC, and Image Comics) have resulted in significant commercial success. While white males have always been able to identify directly with (and, thereby, more easily aspire to emulate the admirable aspects of) characters in comic books, more of the fan community is now seeing, supporting, and demanding comics reflecting the greater diversity of fandom, thereby also opening the door to new fans and creators. Though the panel was a group discussion, most of my favourite moments came courtesy of writer Mairghread Scott, which I will recount below. 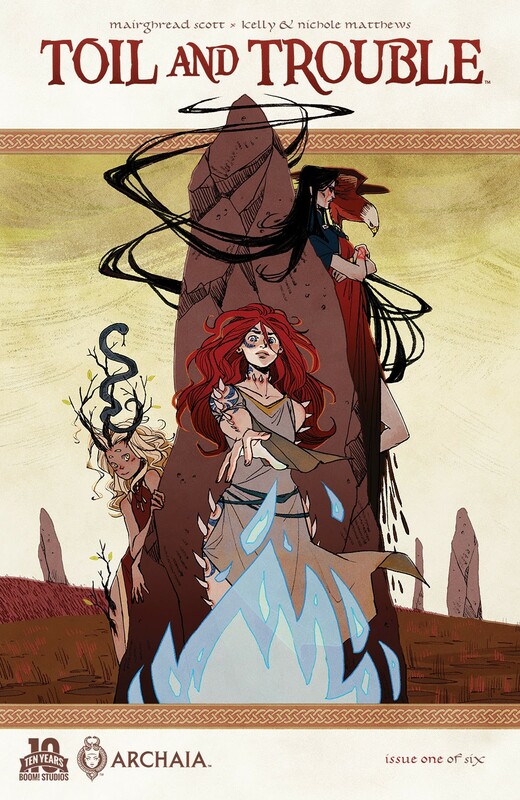 Being a theatre kid, I’m excited about her upcoming six-part series called Toil And Trouble (originally named The Third Witch), which is a parallel storyline to Macbeth. After Filip’s introduction, Mairghread started the conversation by observing that comics are coming to be identified more frequently as a medium rather than a genre (specifically, as shorthand for the superhero story genre). When the topic turned to a question about whether the recent successes are sustainable, she said, “I have a real bone [to pick] when people ask me ‘Is it a fad?’ […] ‘cause I hear that a lot. […] But I feel the rise of comics nowadays is the rise of women and minorities and so, in a way, the subtext of that question is ‘Are women a fad?’” After the applause and laughter had died down, she continued the thought. She later went on to talk specifically about Toil And Trouble and how doing extensive research in her writing process challenged her assumptions and provided real evidence to support racial diversity in the story. Though the panelists were not all as thought-provoking or quotable in their contributions as Mairghread Scott, one thing became abundantly clear listening to the panel’s overall tone. There is a real, spoken goal BOOM! Studios has set for themselves: to be publishing books for everyone. No matter who comes to their booth at a convention, they want to have a book that individual readers will feel is for them. And I think they’re one of the few publishers who might be able to do that successfully.